Georgia State men's basketball team lost to Cincinnati in the Round of 64 during the 2018 NCAA Tournament. Photo by Jerell Rushin. No. 15 seed Georgia State (25-10) will not stay in Nashville, Tennessee until Sunday, March 18 as they packed for. The Panthers fell to No. 2 seed Cincinnati 68-53 in the first round of the NCAA Tournament. The score says the Panthers lost by 15, but they held a seven-point 18-11 lead at one point. They were ready to play in front of the biggest lights they’ve seen. D’Marcus Simonds scored the first 16 points for Georgia State and the Cincinnati crowd was quiet at the 11:46 first half mark. Already at this point, Georgia State was badly losing the rebounding battle—their season-long Achilles heel. State left Bridgestone Arena with only 26 rebounds to the Bearcats’ 46. Cincinnati is a top-10 team in offensive rebounding percentage—they grabbed 20. Their size and physicality was too much for the Panthers. “We knew that was going to be a problem. That’s what they do. They’re a good basketball team and they got a shot to get to the Final Four. The difference in the game for us was just the rebounding,” Hunter said. Cincinnati head coach Mick Cronin praised Simonds’, saying he could start on any team in the American Athletic Conference, which his Bearcats won. Simonds shot 10-20 including three three-pointers for 24 points. Once Cronin adjusted, Georgia State slowly fell behind and never sustained great success for an extended period of time. “They went to the zone. They took away my penetration. So I started facilitating the ball a little bit more,” Simonds said. Another team fault was having just three assists, but their offensive gameplan was largely to get Simonds into isolation situations. Georgia State held the Bearcats to a 38.7 field goal percentage, just below their sixth-best national ranking. The “matchup” defense that Hunter deployed forced Cincinnti to shoot more threes than his own team, not a common statistic this season. With under 11 minutes left in regulation, the Panthers retook the lead, albeit just one point. Senior Isiah Williams came off the bench to score 10 points in his final game as a Panther. When asked about the future of the program, Williams’ emotions overwhelmed him. 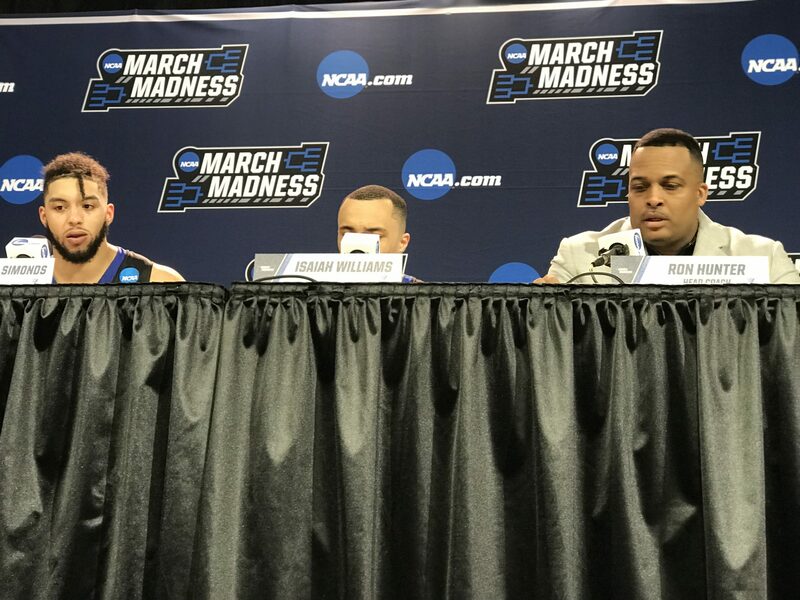 Fellow senior Jordan Session, who is the first Panther to play in two NCAA Tournaments spoke about a moment they will never forget. “During the course of the game, like you said, it got really physical, and we got down, I think, 10 maybe with about seven minutes or so. And I just, I looked at everyone’s face, and we didn’t fold. We didn’t shake. We didn’t seem like we were going to lose the game at any point. We were all smiling and clapping, ready to play, ready for the next possession. And we all kind of picked each other up,” Session said. As the five on the floor knew they would lose, they huddled up and realized how close they were to winning. “And in that moment, I realized we were all a brotherhood. This is a great group of guys. We’re a great team. We’re a great team. We have a great player in D’Marcus, a great coach, great staff, and it’s just moments like that, I realize I really made a family here at Georgia State. It was a great moment for me personally,” Session said. Jarron Cumberland scored 27 points with ease against the Panthers to go alongside a surprising 11 rebounds (8 offensive). Cincinnati’s 6’8” Gary Clark finished with a double-double of 13 rebounds and 11 points. Four Bearcats scored in double-figures. The last time an opponent had four players reach double-digits against the Panthers, they lost as well. Session’s 126 games played ties him for second-most in Panthers’ history. Georgia State returns all four starters besides Session. Damon Wilson plays next season after taking a redshirt following his transfer from Pittsburgh.